Harmer, Bertha. 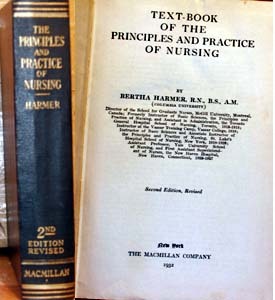 Text-Book of the Principles and Practice of Nursing; revised 2nd edition. New York: MacMillan, 1932, 738 pages. Harmer, Bertha. Text-Book of the Principles and Practice of Nursing; revised 2nd edition, illustrated. New York: MacMillan, 1932, 738 pages. Size: 5.5" x 8.75" x 1.5"